This easy strawberry rhubarb sorbet is one of my favorite ways to celebrate spring and the arrival of rhubarb! I love its creamy texture and bright flavour and the best part for me is that you don’t need an ice cream maker to prepare it. 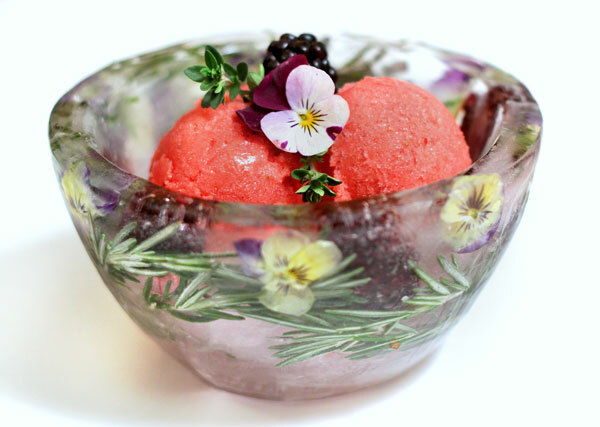 While nothing beats strawberry rhubarb pies and crisps, this sorbet is another great way to bring these two early summer friends together. As for the ice bowls, I’ve been making these ever since I was a teenager. They’re quite magical and definitely a crowd-pleaser. They’re also a perfect way to serve ice cream and other frozen treats because they stop iced desserts from melting too fast on a hot sunny day. All you need to make them are some bowls in two different sizes (a larger size and a slightly smaller size), some rocks to weigh down the smaller bowls, a pitcher of water, and lots of herbs and edible flowers. I like to use a combination of thyme, rosemary, violets, borage flowers, rose petals, and lilac blossoms. I sometimes also throw in a few berries in the mix. 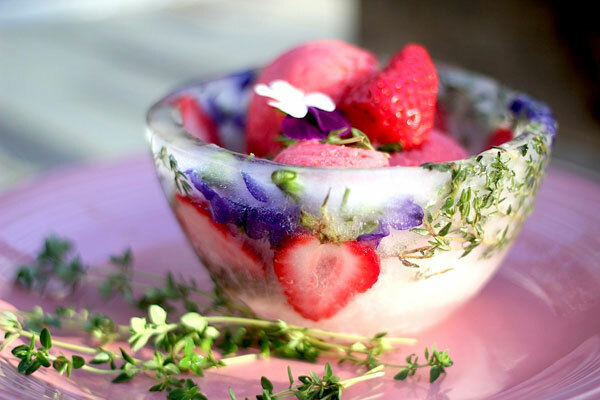 You’ll find my instructions for making both the sorbet and ice bowls below. If you have any questions, feel free to ask in the comments below. Have fun!! 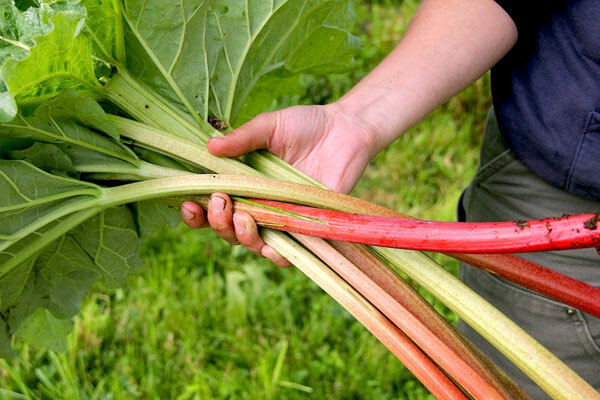 For the sorbet: Cook the rhubarb with a little water (about 1/4 cup) until soft, around 10 minutes. Add the sugar and simmer for another 10 minutes. Allow to cool. 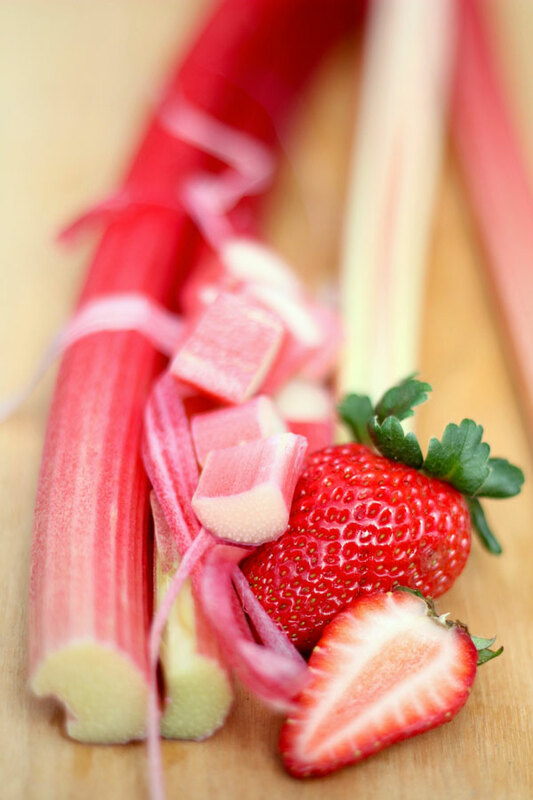 Puree the rhubarb with the strawberries in a food processor and freeze in a shallow pan for about 4 hours. Break up the frozen mix into chunks and return it to the food processor. Puree until very smooth and velvety. Return to the freezer for an hour to two, or until serving time. For the ice bowls:Pour water into the 4 medium bowls so it covers about 1/2 to 3/4 inch at the bottom of each. Put the bowls in the freezer until the water is frozen solid. Be sure to keep the bowls level in the freezer so that the water doesn’t freeze lopsided. Remove medium bowls from the freezer, working on just one at a time so the water doesn’t melt. Place a smaller bowl on top of the ice base inside the medium bowl, making sure it’s centred. Fill the smaller bowl with a layer of heavy objects to keep it anchored down. In the gap between the small and medium bowls, drop a handful of flowers, herbs, and berries of your choice. Try to make them fill the space vertically as well as horizontally by squeezing the larger flowers, herbs, or berries into the gap so that they're held in place between the walls of the 2 bowls, otherwise they might float to the top. Pour water to fill this space so it reaches about 1/2 inch from the rim of the bowl. Tuck in any leaves or flowers that are sticking out of the water. Freeze for a few hours or until solid. Once the ice bowls are frozen solid, remove them from the freezer. Run a little hot water on the outside and inside of the plastic bowls, being careful not to touch the ice, then carefully unmold the bowls. 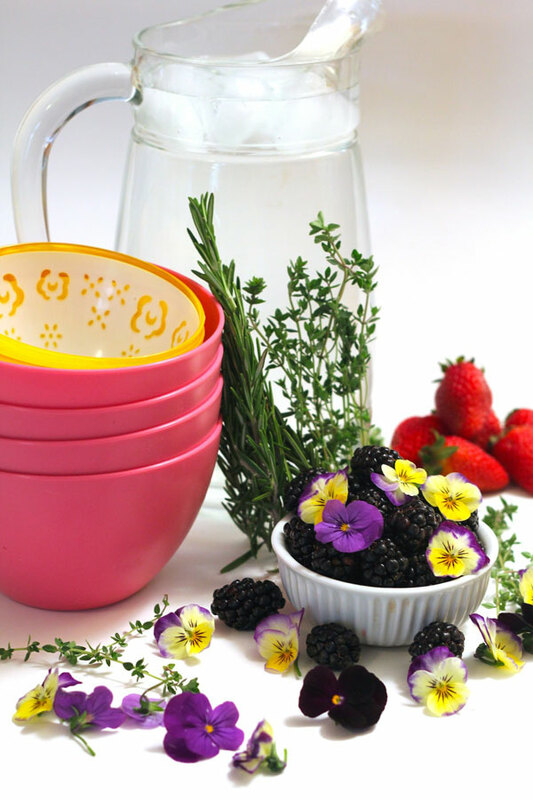 Fill with scoops of sorbet or ice cream and serve immediately.